Do you know that messages you send / receive can be used for Legal Purpose? You don’t want that to happen-¦ Read further about this secret texting app. 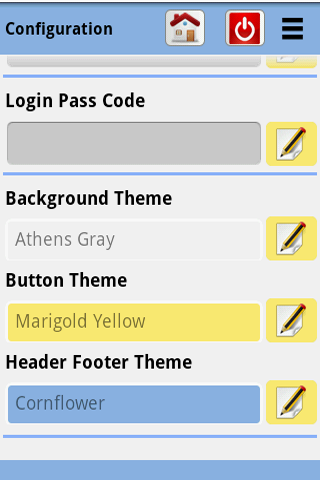 Very smart Top Secret Texting app for android to Send Receive Sensitive Info Privately. Neither Sender nor Receiver will have history of Texting. 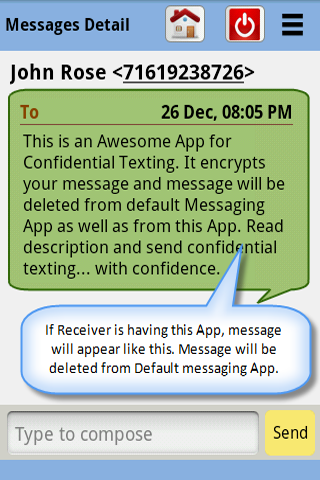 When App sends messages, Best Secret Texting App encrypts text message and sends it to sender. Sender will be able to read it using our smart app and automatically deletes text based on sender’s time limit. Message will be deleted from Sender’s outgoing history too. Maximum life of any message of Private Texting App is just few Hours. 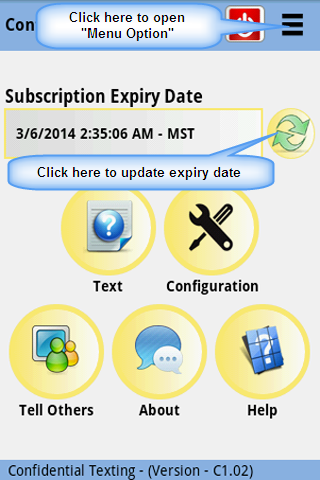 Senders can set message time meaning sender can decide how long receiver can view their messages. Let’s say that sender set up 20 Min. 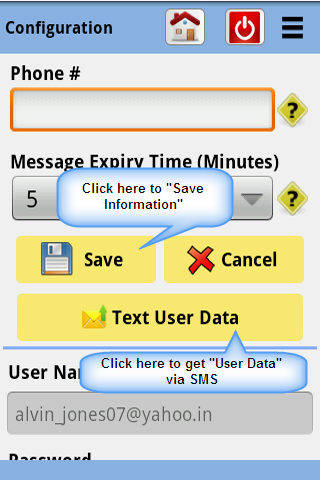 Meaning after 20 Min, messages will be deleted automatically from sender’s phone as well as from receiver’s phone. Now, you can Send / Receive Sensitive Info with confidence. Try it out FREE. No credit card required. The purpose of this Secret texting app is to protect sender’s as well as receiver’s personal information from risks such as unauthorized collection, use or disclosure. If you are not able to understand anything about confidential texting App, meaning this App is not for you. Not Free. Not Cheap. Only for kind and generous professional who wants to send confidential text messages with confidence. Private Texting app android requires Internet Connection to login to App. To protect privacy of senders and receivers, messages are not stored. Just install an app and start texting with confidence. Confidential Texting… With Confidence. This secure texting app for android is best for professionals who don’t want to have their messages with receiver for a long time. Remember, your text messages may be used in court for any legal matter. If you are recommending stocks to someone, you can think of having secure texting app. There are many uses of this Secrete texting app. Just you need to understand capability of this App. Best to Send secret SMS messages. Best private texting app for android. App uses industry standard best practices to ensure the protection of text messages. Top Secret Texting App uses a variety of security features, including encryption, automated message removal, password-protected inbox, and much more. Compare our app with secure texting hipaa app. BTW, our App is not HIPAA-Compliant Texting. This confidential texting app is the best for confidential text messages. This App’s best feature – Text it, Forget it. No back-up. No forwarding. No History. Send and receive secure SMS messages… with confidence. With Private Texting, no one controls your text messages – neither sender nor receiver. Yes, state of the art concept for true private texting. You can text whatever you want to whomever you choose and the messages back and forth will be deleted within 2 hours. Word of caution – If you use it, you will love it. Use it responsibly. This App is only for your personal use. Void when prohibited by laws.